Popular Health Foods: Healthy or Just Hype? Agave! Salba! Find out which new finds in the health-food aisle are actually good for you. Agave, Salba, steviaâ€”oh my! Having trouble telling which new finds in the health-food aisle are actually good for you? Our helpful guide can point you in the right direction. Where youâ€™ll find it: In the baking aisle, near the other sweeteners. What itâ€™s good for: The syrup is roughly 1.5 times sweeter than sugar, without being cloying, and it works well in drinks and baked goods. It has a lower glycemic index than sugar, so it doesnâ€™t cause blood sugar levels to spike as sharply. And agave is a natural source of inulin, a fiber additive that promotes the growth of stomach-protecting probiotics. Worth a try? If youâ€™re looking for a less-processed sweetener, agave is a good choice. But itâ€™s not calorie-free: 1 tablespoon has 60 calories. Youâ€™ll pay more, too: a 23.5-ounce bottle of organic agave is $8, while a 5-pound bag of sugar (which has more servings) costs about $4. What it is: A caffeine-free South African plant that is brewed as a tea; also known as red tea. Where youâ€™ll find it: In the tea and spice aisles, and where bottled iced tea is sold. You can even get a rooibos latte at Starbucks. What itâ€™s good for: Rooibos is naturally sweet, so itâ€™s perfect iced with a little fresh mint or lemon for a low-calorie drink, and it delivers a nice hit of antioxidants. Rooibos also has been used for centuries to combat allergies and skin problems, although these benefits have not been documented. Worth a try? If you enjoy the flavor of this tea, sure. What it is: A sweetener made from the South American stevia plant. 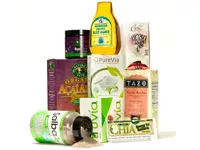 Where youâ€™ll find it: In packets as Truvia and PureVia brands, and in beverages and other foods. SoBe LifeWater is sweetened with PureVia; some Odwalla drinks and Breyersâ€™ YoCrunch 100 Calorie Packs include Truvia. Expect to see more stevia-sweetened products soon. What itâ€™s good for: Itâ€™s nearly carb-free, so stevia may be a smart choice for diabetics and other carb counters. If youâ€™re watching your weight, you could also benefit: pure stevia is 300 times sweeter than sugar but has zero calories. Worth a try? It has a purer flavor than calorie-free artificial-sugar substitutes. But some people complain that stevia has a bitter aftertaste. What it is: Ever have a Ch-Ch-Ch-Chia Pet? Salba seeds are a strain of chia seeds, which have been eaten for centuries in Mexico and Guatemala. Where youâ€™ll find it: In the nuts-and-seeds section or supplement aisle. Salba is now in energy bars, salsa, and more. What itâ€™s good for: Use these nutty seeds the way youâ€™d eat flaxseedâ€”mixed into yogurt, tossed with cereal, or sprinkled over salads. Worth a try? Yep. The seeds contain a very rich form of ALA omega-3 fatty acids, which have anti-inflammatory benefits. They are also high in fiber, gluten-free, non-allergenic, and a good source of protein. Thereâ€™s some debate over whether Salba seeds are just white chia seeds with fancy branding: The Salba brand sells a 16-ounce jar of whole seeds for $27 plus shipping (SalbaStore.com), while the same amount of regular white chia seeds can be found for $12 (Amazon.com). Either way, theyâ€™re both good for you. What it is: A berry from palm trees in Central and South America. Where youâ€™ll find it: In the freezer section and the supplement aisle, and in juices, nutrition bars, and cereals. What itâ€™s good for: These berries are rich in antioxidants and healthy fats. Frozen aÃ§aÃ­ pulp is great in smoothies (try our Sunrise Smoothie Parfait) and has a flavor between blueberries and dark chocolate. Worth a try? Products made with aÃ§aÃ­ can be pricey, so donâ€™t feel you have to load your cart with everything aÃ§aÃ­. A better bet: sample aÃ§aÃ­â€”and these other â€œItâ€ foodsâ€”and work what you love into a well-balanced diet. And what the heck is gluten-free? Gluten is a protein found in wheat, barley, and rye. Gluten-free foods are often rice- or corn-based. While some people avoid gluten for medical reasons, others do so to lose weight. If you donâ€™t have celiac disease, the benefits of going gluten-free are unclear, and it can be expensive.